Window Wanderland is coming to Manor Farm soon and the best thing about it is it is not only fun but totally free! It is being held on the 1st and 2nd of March from 6-9pm with workshops being held on 8th and 22nd of February at Horfield Leisure Centre from 4-7.30pm. There will be a prize draw for all entrants with a 6 month membership of the Leisure Centre or 12 weeks of swimming lessons on offer. There will also be separate prize draws for people visiting the Wanderland trail. Please send your photos to us here at the Horfield and Lockleaze Voice and we will publish a spread of them in our April edition, we might even come up with a modest prize for the best one. Set designer, Lucy Reeves Khan started Window Wanderland in 2015, inspired by her vivid imagination, her deep-seated community spirit and her personal experiences of isolation due to years of chronic illness. Lucy imagined her local streets alive with other people viewing dramatic, beautiful or just silly scenes in the windows around her neighbourhood. 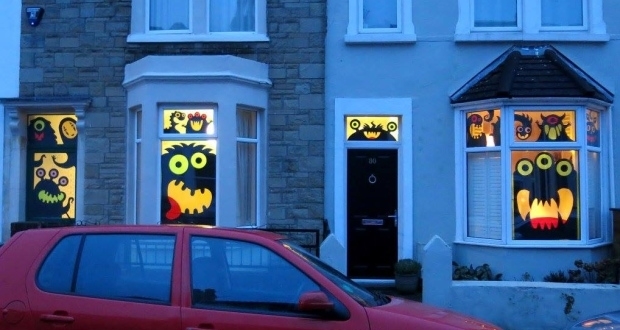 She wondered if, in the dark of winter, these displays would cheer up others too. She put on her first event in her own community. It was a huge success. Window Wanderland say, “Community events are massively beneficial for spreading happiness and a sense of belonging in neighbourhoods. But they often rely on the sweat, determination and dedication of a handful of people. It’s not always sustainable. We know putting on a Window Wanderland event is definitely, definitely worth it. But it isn’t easy doing it by yourself. Our website is designed to make it much easier. It is created by Window Wanderland CIC, a non-profit organisation that aims to spread happiness and bring communities together. We share everything we’ve learnt, offer inspiration and provide customisable toolkits, so organisers can create their own events, year after year, with ease.